As foreshadowed in our issue of last Thursday, the illness of Dr. Adair proved fatal and he breathed his last at half-past nine Friday evening, the 14th. The severity of his attack of pneumonia and the unrelenting hold it seemed to have, made his case seem problematical, even to himself, from the first; yet all had hopes that the inherent strength of a strong mind, a sound body and the vital power that comes of a life always free from, hurtful habits, might give him the victory and spare him for yet further usefulness. But pneumonia is a dangerous foe to combat and is said that when a man has passed the age of sixty it is well-nigh fatal. And so it proved with the Doctor. In many instanced in his years of practice he has seemingly stayed the hand of death, but when it laid its cold hand upon him he could not shake it off, and the loving husband and father and Useful citizen is no more. Reading of the scriptures; solo by Miss Mary Calkins, Wyoming-"The Lord's Prayer" (by Adams); reading of scriptures, followed by poetic quotations from Adelaide A. Proctor and Whittier; solo-" Paradise, O Paradise;" obituary and sermon followed by prayer; solo-" De Profundis," a chant. Miss Calkins' renditions were given with a delicacy and her accompaniments on the piano with sympathetic touch were wonderfully in harmony with the solemnity and the sorrow of the occasion. Mr. Judy spoke with earnestness and effectiveness, and his language and thought held the undivided attention of all within the sound of his voice His discourse as reproduced and furnished to us is as follows. I think thou wouldst rejoice and not complain. All clear, and wise, and bright. And yet thou canst not know. Wisdom and right are well, but Trust is best. Crown him, honor him, love him. Stoop, manliest brow, above him! The long years may not fill. His hand the work had done. In traveling one comes at times upon a scene so rich in variety and grandeur that the simplest words which can be used to fully present its features to the reader become the most eloquent description that can be written. So are there lives so rich in character and performance that the simplest presentation of their story that can be given becomes the most eloquent tribute of appreciation. Such a life was that of Dr. Adair, and with the aid of a friend, who knew him well, together with the use of my knowledge of him, I would endeavor thus to present simply and accurately the story of his virtues and achievements. The parents of Lyman Joseph Adair, Alfred and Martha (Chamberlain) Adair, were respectively of Scottish and English decent, Lyman, their oldest son, was born in Monroe county, New York, on November 28, 1840. In the following year they removed to Summit county,Ohio, where the boy grew up in the midst of a considerable family living the wholesome life of farmers. At eighteen, with no teaching save that of the family and the common schools, he had become himself a teacher; and from the fall of 1858 to 1861, in the intervals of teaching, he was a student at Hiram College, then under the presidency of Garfield. To one of his sterling character the call for troops suppress rebellion was irresistible. He at once joined the 19th Ohio Infantry and engaged with it n the mountain campaign on West Virginia. The term was but three months, and at its close he returned for a time to his teaching; but early in 1862 he re-enlisted in Co. H. of the 104th Ohio Infantry serving in that command continuously until the war ended. His field of service was that of the Army of the Cumberland, under Buell, Rosencrans, Thomas and Sherman. In the long fight for Kentucky and Tennessee, the Atlanta campaign, and the destruction of Hood's army at Franklin and Nashville, he bore a manly part. In more than one exigency the young First Sergeant found himself in command of his company, and what ever duty fell to him was performed with characteristic fidelity. The flag of his regiment bears the names of twenty-four engagements in which he took part. At one of these, Columbiana, Tenn., a gunshot wound through the cheek disabled him for the moment. It was hurriedly dressed, whereupon he seized his musket and, finding his place in the ranks, continues in the fight until victory was won. 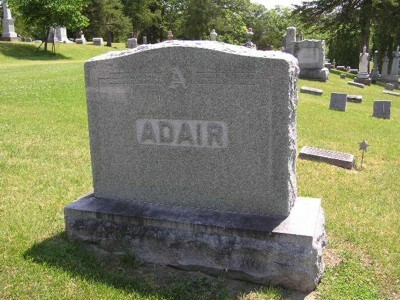 After the war, Dr. Adair came west, accepting whatever employment came his way. For a time he worked in the lumber mills at Dubuque, continuing his studies preparatory to a profession. In 1867 he entered the office of Dr. Morse, at Manchester, Iowa, and supplementing his savings by an occasional term of teaching, was graduated at Rush Medical college with the class of 1870. He settled at Anamosa soon after and here his long and useful life as physician and surgeon has been spent. October 19, 1870 Dr. Adair was married to Sarah J. Porter, this marriage bringing him into close touch with some of the best lines of American culture and insuring him the companionship of a wife who was a constant stimulus to a broad and rich cultivation of the world of letters. To this marriage three children were born, two of whom died in infancy, and one, Frederick, grown to manhood. As a physician, Dr. Adair was strongly equipped both with intellect and with character. His skill and natural aptitude for his profession were soon evident. His practice grew rapidly, for a young man, and he continued to grow with his practice, being an earnest and persistent student and a man of rare soundness of judgment. Moreover, he had the energy of a man of business, and that instinct of the good craftsman which made him quick to appreciate all the best outward aids and resources of the physician and surgeon. Such forcefulness, natural aptitude, persistent energy have their legitimate fruit in the course of a few years and brought the Doctor to a foremost place among the physicians of this part of the state. It was therefore through a past recognition of his merits that he was chosen to be physician of the penitentiary and was retained there for nineteen years. A touching evidence of his influence in this position is borne by a beautiful wreath which was sent today by the inmates of the prison as a token of their regard. His extraordinary personal control over the insane led to the establishment of the insane department of the prison. His success among these sadly afflicted patients was one of the marked events of his career as a physician. And here it was no doubt that his strength of character showed conspicuously in connection with his practice. The great kind-heartedness which pre-eminently characterized him combined with a genial yet firm and commanding personality, brought over these afflicted persons that power of spirit which, in such cases, is often more soothing, if not more healing, than medicine. And this same power of spirit he carried into his general practice When he entered the sick room there entered the man of great heart, as well as the doctor of large skill. Firm, impetuous sometimes, yet always kind and cheery, his presence was a godsend, a sunshine of the soul that brought healing in its rays. More over he had the unsparing devotion which is the mark of the true doctor. Long night rides over hill and dale, hard journeys in all kinds of weather, out of the warm room and cozy chair, no matter how badly he may feel himself-such is the life of the doctor, and such was the constant life of Dr Adair. I know not how it may have been with others of you who may have read Ian Maclaren's "Doctor of the Old School." but as form, I knew no physician in all my acquaintance who seemed such a fine exemplification of this heroic and beneficently, skillful type of character as Dr. Adair. As a citizen Dr. Adair did hid duty. He neither sought nor did he shun public office When it came to him unsought, he accepted it, as becomes every true citizen, and he discharged its duties with that thoroughness and integrity which characterized all his performances. He was for several years a member of the School Board, serving part of the time as president. As a member of the Board of Examiners for pensions, as a comrade of the G.A.R., as a Mason, Modern Woodman, and a member of other fraternal organizations, he kept himself in close touch with the organic side of our national life. He also did his duty by the various local and national associations of his profession, showing by his membership and attendance that he freely realized that in every other branch of human activity, unity is strength. We must regard it as one of the evidences of his breadth of mind and character that he fully appreciated the supreme importance which association plays in human affairs and was ready, in this realm, as in all others, to do his duty heartily and unselfishly. Nor was he unmindful of his duty toward the church, recognizing that association for morality and religion is one of the necessities of a high civilization. His sympathies in this field were broad and progressive and led him to align himself with those Liberals who are eager to forward a presentation of religion that will bring it in touch with freest and ripest thought of the day. Politically he was an ardent and active Republican. At various times he served on the county central committee, and was at all times actively interested in the issues of the campaign, showing in this direction something of that eager and unsparing absorption in the public welfare that characterized his citizenship in other ways. Socially the Doctor was richly gifted. Full blooded, genial, eagermined and broad in his sympathies he was marked for large companionship. His public and professional duties were too constantly pressing to allow him much time for society, but when a respite came and he found himself free for a few days he threw himself heartily into his social opportunities and won his way quickly even into the heart of comparative strangers. A nature so richly charged, so well disciplined, so largely cultivated as his must pour itself out to the delight of friends and comrades. Take it all in all, looking at his life from many points of view, what shall we say of Dr. Adair, if not that he was framed on a large plan? Large and strong in body, large-mimed, Large-hearted, large-soled, he was surely as fine a type of the best American manhood as we shall easily meet. In minds made better by their presence"
must be apparent to all who can see deeply. But granting, as it is our glad privilege to grant, that the influence of such rare and rich life will live long in the community reaching lives that we dream not of and touching them to higher issues in ways which no imagination can discern, yet the time must arrive when even this remote benefit of his life will cease to have effect here on earth. For this earth must pass away, every drop of water upon it will be dissipated, every green thing will vanish, every life will die, its solid frame will be shattered into fragments and be resolved back once more into star dust. This end to the man of science is not a possibility but a certainty. And when that end shall have come to the earth what then will remain of the influence of these high main of the influence of these high and heroic lives? For then we see that the benefit of all the ages is garnered into these immortal souls and preserved for uses that transcend all dreams of longing; yes, transcend the utmost that we can conceive. For we must remember that infinite progress is necessarily involved in this expectation of life eternal. The thought of a stationary existence is utterly repulsive. Only in the thought if unceasing advance can immortality be made engaging or be made to stand in the light of the deepest thinking. Do something, I pray, to picture to yourself what infinite progress would mean. Combine in one personality the genius of a Shakespeare, a Newton, a Curvier, a Bacon, a Darwin and a Lincoln; set such personalities in communities; encircle these communities in a scene and circumstance according with their loftiness of being, and then you will have some faint sign and token of that life which awaits the soul when it shall have gone a little forward upon the road of infinite progress. In this prospect is a heaven that must surely engage and allure every thoughtful man and woman, and standing in vision before that prospect we can entertain the expectation and speak the word which alone can take the sting from death. For no other fate that can be named would offer a just outcome to the struggle for virtue and a sure consolation to the need of affection. But in that outcome there is balm for sorrow's utmost wounds and inspiration for the most heroic life. Surely has non been left vain! The floral tributes were exceedingly beautiful and varied and yet there was no excessive display, the family preferring to avoid everything of this kind as well as in the matter of attendance in a formal way by civic societies of which Doctor was an esteemed member. The active pall-bearers were F. O. Ellison, R. M. Peet, J. S. Mallory, John Hale, C. M. Brown, W. H. Sanford, H. P. Smith and Marquis Barr. Mr. C. R. Howard was in charge of the general arrangements. Interment at Riverside, with prayer and the benediction by Rev. Judy.